Uprights and crossbar made from 80mm diameter aluminium, with steel fixed back tubes and drop over back bar powdercoated white. Conforms to BS8462:2005 when properly anchored. Each goal frame weighs 16' x 4' = 49Kg 12' x 4' = 42Kg. 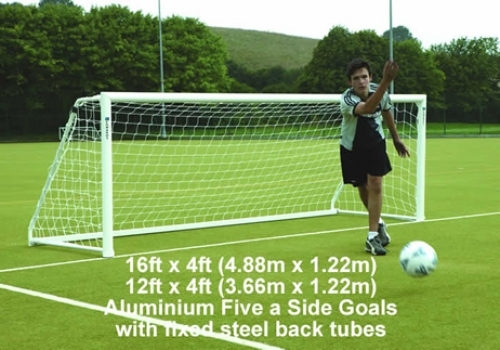 Price is for a PAIR of goal posts and INCLUDES 3mm nets and carriage. Please Note: If you wish to pay by cheque and post your order, select the "Cheque" option when you checkout.